For any threat to public safety on the Metro system, call Transit Watch at (888) 950-SAFE. To ensure Metro patrons and employees can ride and work safely, without fear, 100% of the time. As of July 1, 2017, Metro amended its law enforcement structure to include a multi-policing model inclusive of Metro’s Transit Security Guards (TSOs) and contract security personnel. Metro’s law enforcement model includes the: Los Angeles Police Department, Los Angeles County Sheriff’s Department and Long Beach Police Department. This multi-agency approach will allow for higher visibility, enhanced response time, improved customer experience and deployment of specifically trained officers to engage patrons with mental illness and/or homelessness. If someone riding near you forgets a personal item, remind them to take it along. Know the location of emergency phones and memorize the Metro Sheriff’s Hotline: 888.950.SAFE (7233). Report any suspicious behavior, persons in unauthorized areas or unattended packages to Metro, Sheriff, LAPD or LBPD personnel immediately. Metro created the “Tap With Pride” campaign as a way to work and partner with the community to gain greater fare and code of conduct compliance. The campaign focuses on partnering with faith-based organizations, community centers and schools to better educate the community on the Metro system and fare discounts. As part of the Metro Transit Court citation process, the Youth Fare Resolution Program is an internal Metro program where youth violators are contacted and counseled on how to expunge their fare violation records. The Department of Homeland Security (DHS) has initiated a nationwide campaign called: See Something, Say Something TM to raise the awareness of the travelling public to terrorist activities and to encourage the public to tell local law enforcement officials about the activity they may have seen. For more information on the Los Angeles initiative, visit www.transitwatchla.org. 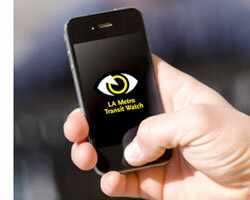 The LA Metro Transit Watch App is a quick and easy way for transit riders to communicate directly to Metro about suspicious activity or quality of ride problems at a Metro station or while riding a Metro bus or rail line. Be our eyes and ears and help make Metro more secure. The ridership experience by nature puts strangers in close proximity to one another and forces them to share space. At times, feelings of discomfort and feelings of entitlement result due to this shared space, and some riders need to be reminded of what is acceptable conduct on the transit system. Sexual Harassment is OFF LIMITS on Metro. For those Metro customers who have been exposed to these incidences, Metro offers counseling support on a 24-hour, 7-days a week basis. If you have been a victim of sexual harassment or any other crime, contact law enforcement by calling 911 or using the Metro Transit Watch Application. IT’S OFF LIMITS Counselors are available 24/7 at: 1.844.OFF.LIMITS (633-5464). There are currently 53,000 people in LA County whom are homeless and looking for alternative shelter. In spring 2016, Metro created the Metro Homeless Task Force to address the displaced persons that have turned to Metro system and property for alternative shelter in addition to Metro enforcing continuous fare checks. Out of the Task Force, Metro created the Metro Transit Homeless Action Plan which was presented to the Metro Board of Directors in February 2017. The Action Plan’s goals are to enhance the customer experience, maintain a safe and secure system, and provide coordinated outreach. Components of the plan include Metro’s coordination with County and City Measure H and Measure HHH. The plan also called for the hiring of two C3 teams (County, City, Community) through the County Department of Health Services as indicated by Metro’s Board of Directors whom ultimately were able to place 12% of their homeless contacts into some form of shelter. These C3 teams expanded to a total of eight teams working together with Law Enforcement homeless outreach, Measure H homeless outreach generalists and Department of Mental Health outreach workers to provide comprehensive homeless engagement throughout the entire Metro system and properties during day and evening operations. Use Metro’s Transit Watch Application to report a person in need of homeless outreach. To learn more or participate in Metro’s Homeless Task Force please email HomelessTaskForce@metro.net, or visit www.metro.net/riding/homeless-task-force/. Never run after or next to a moving bus or train. Don’t play near buses, trains or tracks; pushing and shoving can cause accidents. Hold on to your child when a train or bus approaches. Cell phones, smart phones and other electronic devices are great ways to use your time on board, but they can be attractive targets for thieves. These simple precautions can reduce your risk. Be Alert -- Most thefts are surprise grabs, with phones or other items taken from unsuspecting riders who may be engrossed in using them at that moment. Be Secure -- Put your phone away when getting on and off trains and buses. It’s a prime time for thieves to strike. Be Aware -- Trains are a favorite venue for phone thefts due to the large number of passengers and exits. Be alert and keep your phone! Please note location, bus or train number. Wait for exiting passengers to leave before boarding. Watch out for the gap between the platform and the train. Once inside, take a seat if possible. Be ready to exit when your stop is approaching. Watch your step as you exit the train. Arrive at your bus stop five to ten minutes early. Wait on the sidewalk by the bus sign, away from the curb. Check the headsign above the windshield of the bus for the route number and destination. Make sure to check the headsign just before boarding since buses may sometimes change routes. Signal the operator to stop for you by waving. Wait until the bus comes to a complete stop and the door opens all the way before boarding. Watch for your destination. If you are not familiar with the area, ask the operator to call out your street. About one block before your stop, signal the operator to let you off. Press the rubber strip or pull the cord located between the windows to activate the buzzer. Whenever possible, please exit using the rear door. This speeds the boarding of new passengers. Finally, check to be sure you have all your belongings with you — and don’t forget your bike if you used the bike rack!